As a freelance copywriter, I am always on the lookout for inspiration, and some of the new advertising techniques to have emerged over the last decade or so have certainly caught my attention. Take a look below for some of the latest ways in which companies are trying to wow existing and potential customers. Originating in Manhattan in 2003, flash mobs have become an iconic guerrilla marketing method, and as you will see below, they involve a lot of people, and a lot of organisation. Flash mobs take place in public areas, with the surrounding people clueless as to what is about to occur. Simply put, a large group of people gathers in the venue of choice and one of those people starts to dance. As time passes, more people join in, until everyone involved is cutting finely tuned moves, with wowed spectators standing by (hopefully) clapping. A more detailed breakdown of this new advertising method can be found here. As modern and appealing promotional tools come, they don’t get much better than this. An iconic venue, iconic songs, and a possibly-now-iconic dance routine. The video ends by zooming in on two friends looking at each other’s phones. No brands are visible but I assume they are T-Mobile devices. Their chuckling faces are accompanied by the line “life is for sharing”. Well, in terms of bringing slogans to life, this advert does a pretty good job – 40 million views and counting. As the name suggests, a viral video, if done well, has the potential to spread through the cells of the internet, reaching millions of people, many of whom will also share with their friends, and so on, and so on. With no less than 140 millions views, this public safety advert, from rail organisation Metro, uses fictitious animated characters to act out a myriad of darkly humorous scenes. The stark contrast between the colourful characters and the extremely serious subject matter gives the add a very effective edge. Also of note is the fact that every element of the video, while suitable for an adult audience, primarily speaks to those who are most likely to find themselves in dangerous situations close to rail tracks – kids. The Dumb Ways to Die video has also spawned various parodies, which is a fine example of just how powerful a viral video can be. From a commercial perspective, if a company really hits the nail on the head with viral videos, then parodies/other versions made by wannabes will ensure that the original producer enjoys life-long publicity. For some tips on how to create a viral video, check out this article. How many times have you driven past an advert and not even noticed it? Would you notice the advert if it was on a sign being spun, flipped, and tossed around by an expert break dancer? The pioneers of sign spinning thought that a lot of people would answer “yes” to the second question, which is why streets across the world are now peppered with talented dancers giving street advertising some much needed choreography. This guy has some serious skills, and if you’re interested in learning about the origins of sign spinning, click here. While animal ambassadors are not exactly brand new on the scene, the meticulous thought which now seems to be going into these characters is fairly new. The obvious example here would be the meerkat adverts used to promote comparison site Compare The Market. The meerkat theme is laced into every aspect of the company’s service; yep, if you take out insurance through Compare The Market, you even get a meerkat doll. This emphasis on animal ambassadors seems to signal a shift in advertising over recent years. I have a sneaking suspicion that two meerkats hanging out with Macaulay Culkin would not have sold as much insurance as it is doing these days. Street art has been coolifying streets around the world since its it swept into popular culture around the beginning of the 2000s. Since that time, it has been twisted and turned into many different forms, with companies now embracing it to stir up hype and appeal to the cool young market segment. Everyone has to look where they’re putting their feet right? Well that’s where vandaltising comes in. 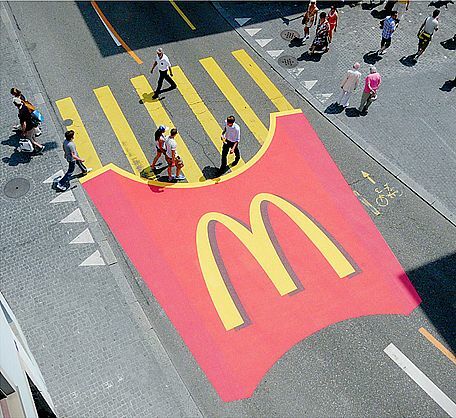 As you can see below, this type of advertising is not too dissimilar from street art, and takes the form of company stencils which line the pavement, making it virtually impossible for pedestrians to avoid them. This form of advertising was originally used to promote bands, and was found on walls rather than pavements. When it first came into use, companies using this technique were criticised because of the threat their actions posed to the environment. However, recent times have seen a growing trend of companies using washaway, environmentally friendly material to create their stencils. Vandaltising endows companies with a very cool, modern, vigilante-esque image, and seems set to be around for years to come. Not to mock the advertising world of yesteryear, but the range of techniques being used today really is exciting. It seems as though there is no end to the ways in which traditional techniques can be reinvigorated, or existing street features utilised to facilitate an advert. Great observations Michael. Some really creative spins on traditional advertising methods. Thanks Jamie. I saw loads of that vandaltising when I was living in London. Always wondered about the legality of it ha. Cheers for commenting!